And this from the director of Casablanca. Pity poor Michael Curtiz. His most famous film must have been a heavy burden throughout his checkered, if somewhat undistinguished, later career. I imagine it as a cinematic equivalent of "We can put a man on the moon, but we can't ______." That is, if people even know the name of the guy who directed Casablanca, which I'd bet most don't. It's a movie more associated with its stars than it is the hands guiding them, and though a glance at Curtiz's filmography reveals a couple of other notable efforts (Mildred Pierce, White Christmas), there's also a lot of films that are otherwise unremarkable and/or forgotten. 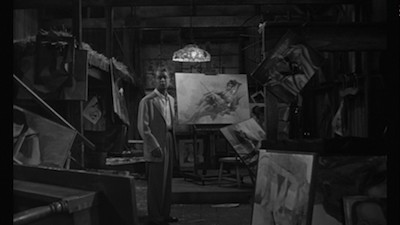 Like 1959's The Man in the Net, a film that displays such little skill or craft, you'd think it was made over a weekend by a studio's C-Team left alone on a backlot with a couple of rolls of film and nothing else better to do. To be fair, it's not Curtiz's fault alone, hardly anyone here shows any real gift or passion for their job. The Man in the Net is a movie that just kind of happens until it doesn't happen anymore, end of story, roll credits. The mind boggles at how little energy is expended getting there. If the blankets were any heavier, none of the crew might have even gotten out of bed that morning. Alan Ladd stars in The Man in the Net as John Hamilton, a "young" painter who has moved to the countryside to pursue his craft. I put "young" in quotes because Ladd, who was in his late 40s, shows every sign of being anything but youthful. He moves through the movie as if on painkillers, speaking in his trademark deep-throated monotone, rarely raising the pitch even when his life is in danger. This is partly in keeping with the nature of his oh-so-annoying character. John is the kind of guy who, when accused of belting his wife, refuses to address the accusation. He is intended to be stoic; Ladd manages stoned much better. Another big reason John has left New York for the wilderness is his wife's nervous anxiety and alcoholism. Linda Hamilton is played by Carolyn Jones, best known as Morticia from TV's The Addams Family, and the one bright spark of energy in this otherwise somnambulist film. She rages and relents and cries and actually shows some verve. She also plays to age--Linda is 28, so is Jones--though in Hollywood, she is already aging and freaking out over it. Ladd looks like he's falling apart, but he's still presented as a strapping version of manhood; Jones is gorgeous, but the fear of a few gray hairs signals the end of her time as a viable woman. No wonder Linda has fallen off the wagon and is angling to get back to the city. After she pushes John to go on an overnight trip to answer a job offer, she disappears, leaving a house full of slashed paintings and a cryptic note on the typewriter. The small town folk who already think John is a weirdo and a purveyor of dirty pictures decide he has killed his blushing bride, including the sheriff that Linda previously suggested she has been stepping out with (character actor Charles McGraw). The only ones who believe in John's innocence are the one rich lady that always inexplicably liked him (Diane Brewster) and the local kids. It's the kids that provide The Man in the Net with its most bizarre plot development. It's established from the get-go that John is a good guy because he likes to hang out with the children and sketch while they play. He even likes the little black boy, whose parents are servants working in the wealthiest house in the neighborhood. John doesn't care, he's a good egg. When John is on the lam, the kids hide him and help him work an elaborate scheme to expose Linda's lover, who might be the real killer. It's a cornball move, like a cheap sitcom plot. Just as one would expect better from the director of Casablanca, one should also expect more from writer Reginald Rose, whose previous credits include the script for 12 Angry Men. Did all of these guys get this gig after losing a hand in a poker game or something? The Man in the Net isn't a particularly inept film. It can't be, it doesn't have that much aspiration. It's just a dismal assembly line effort, a failed starring vehicle for an aging actor with perfunctory construction work by accomplished journeymen who show little interest in their assignment. At the time, The Man in the Net likely filled a hole in the production schedule, allowing MGM to reach its regular quota. As a movie, it's not really hateful, just boring and forgettable--and thus not really worth the bother to begin with. 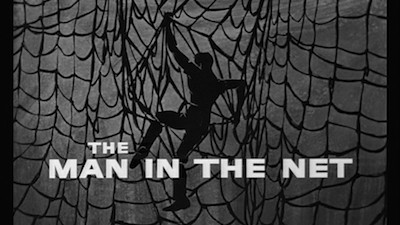 Released through the MGM Limited Edition Collection, a manufacture-on-demand initiative run by the Warner Archives, The Man in the Net is sold as a blue-backed DVD-R with a minimum of frills. As these things go, the widescreen image is actually pretty good, with a clear picture and decent resolution. Lights and darks look fine, and there isn't any real digital noise or damage outside of the occasional flash or pop within the image frame. The original audio is presented in mono and sounds just fine. There was no background hiss or distortion, everything is nicely modulated and easy to hear. Skip It. I can't pretend to really know what went on behind the scenes in 1959 when The Man in the Net was being made, but I can't imagine any of the people involved were all that excited to be on the set. If they were, it certainly didn't translate into the work. 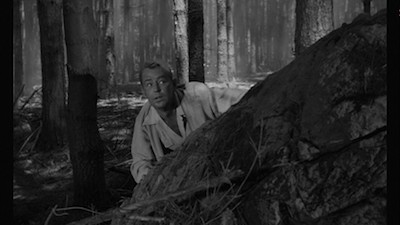 Directed by Michael Curtiz from a script by Reginald Rose, The Man in the Net provides Alan Ladd with a late-in-life starring vehicle, letting him pretend to be 20 years younger while hiding in the woods after being falsely accused of killing his wife. He's the kind of guy who stubbornly makes the wrong choices for no good reason and whom people hate or love for the same no good reasons, and the only ones more bored by his predicament are the audience. 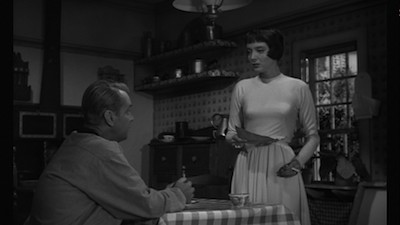 The only possible excuse to watch this dull thriller is if you're a huge Carolyn Jones fan. She's very good, everything else is just a waste of time.